Name. Name of the Publication Channel. Description. Description of the Publication Channel. Publication Channel Type. Should be set to DPS. Publish System. Should be set to Adobe DPS. Suggestion Provider. Should be set to None. Publication Channel Type. Should be set to Web. Publish System. Should be set to Drupal 6. Publish System. Should be set to Drupal 7 — Publish Forms. Publish System. Should be set to Facebook — Publish Forms. Note: When creating a new Publication Channel, the following settings only appear after filling out the settings at the top of the page and clicking Update. Publication Channel Type. Should be set to Print. Publish System. 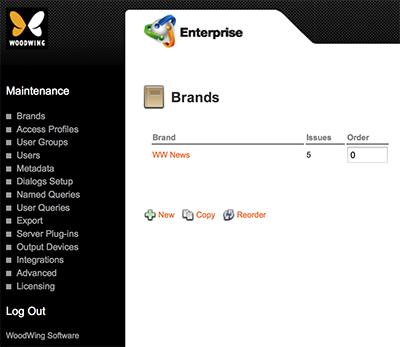 Should be set to Enterprise (this is the default setting which does not use a publishing system). Publish System. Should be set to Twitter Publishing Connector. Note: Further settings are set on the Issue Maintenance page. Step 1. 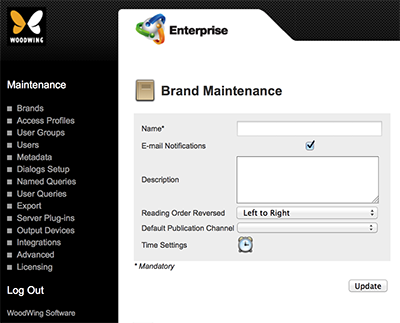 Access the Publication Channel Maintenance page. 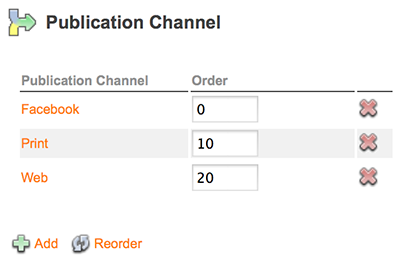 Figure: The Publication Channel Maintenance page.